Picnics are always fun and a chance to spend some memorable time away from home with your friends and family. Nowadays picnics have become more luxurious and people are no longer relying on sandwiches and drinks for the picnic menu. Perfect picnic menu is preset keeping in mind the place, weight, preparation time, quantity, weather, and crowd as there should be something for everyone to enjoy. Barbeque, grilling, live cooking and table full of food is the new trend. Keeping in mind all the considerate factors I have compiled 99 perfect picnic menu ideas for starters, main dishes, desserts and drinks. Picnic means fun with a lot of games and energy consumption. This means you need to keep some ready to eat snacks and a few appetizers to munch on the way. Make sure that the food is properly packed and only select the items that suit your picnic conditions. For example chicken spread in sandwiches contains mayonnaise which can change its taste if not stored in a cool dry place. The trend of eating healthy has encouraged the addition of different types of easily prepared salads in the picnic menu. Here is a list of some easy picnic salad recipes which can be prepared in no time and are very appetizing as well. Try to take separate ingredients and make a fresh salad just before you wish to eat but if you will not have such facilities and wish to save time and hassle at the picnic than prepare the salad and allow it to cool in the refrigerator for some time so that it can stay fresh for long. Place your salad bowl in a cooling bag or icebox if possible. Sandwiches are easy to eat, quickly prepared and loved by everyone. Picnics are incomplete without sandwiches. Now comes the main part of your picnic menu which should be easy to prepare, takes less preparation time while being nutritious and tasty at the same time. Presentation counts a lot! Give your dish a creative touch and take along some simple garnish. You can keep your main dishes half done or marinated before at home to make your work easy later on. A few main dishes like Shami kabab, lemon chicken slices and seekh kabab can be reused in sandwiches at tea time. Individual serving is a little difficult at picnics and making efforts to keep the desserts cool till the end of the meal is not easy. Keeping in mind the availability of resources on a picnic day out, here are some simple dessert ideas which will surely satisfy your sweet tooth craving. 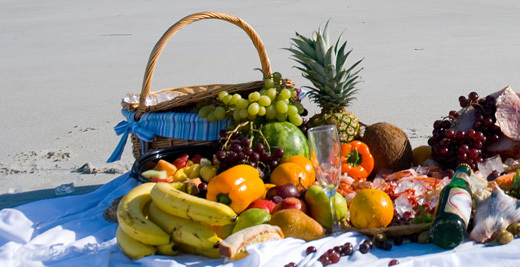 The best dessert to be served on picnics is fresh sliced fruit. Cupcakes or brownies can be easy to serve and you can prepare them a day before too. Drinks are always a very important part of picnic menu especially in summers. Don’t forget to keep a lot of thirst-quenchers as usually the demand of drinks is more. Don’t forget to carry sufficient ice cubes to serve your drinks cold. Keep colorful disposable glasses and cups to make the serving easy. I suggest that the picnic menu should be kept simple so that you can enjoy with others rather than being busy all the time in food preparation. Now you can easily make your own perfect menu by selecting your favorite combinations from the above compilation of 99 perfect picnic menu ideas. Do share with us your ideas of a perfect picnic menu.